Rummy Millionaire is bringing a promotion which will benefit you if you have many friends. 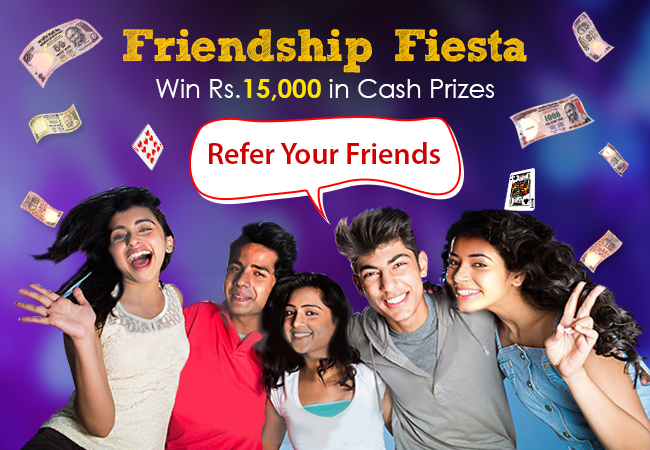 Bring in your friends and get a cash prize of up to Rs.15,000. This one day promotion will test your friendship and will also boost your rummy account. The Friendship Fiesta promotion from Rummy Millionaire will start on 15th November at 00:01 hours and will end on 23:59 hours. The more friends you invite in the promo period, the more cash you can win. Your friends will have to join Rummy Millionaire and should make a deposit not less than Rs.100 and play 5 cash point rummy games. The first player who has successfully invited and made his 20 friends to deposit and play at Rummy Millionaire will receive Rs.5000 in cash prizes. To know about other amazing promotions and bonus packages, you can visit our category named News and Promotions. Please drop your feedback and suggestions on our rummy news and articles in the comment section below. Your suggestions help us bring the best promotions and bonuses in front of you!